Donald Trump’s pointless budget is a perfect symbol of his administration. Trump’s Budget Guts the EPA and Help for Poor Seniors. It’s a Perfect Symbol of His Administration. The budget plan that the Trump administration released Thursday is a sad, vicious, and mostly pointless document, the political and policy equivalent of shouting “America First!” to the wind while gunning your Dodge pickup into a lamppost. In order to fund a $54 billion increase in defense spending, it takes a machete to all manner of federal programs—aid for the poor and elderly, cancer research, public television, job training, and so forth. It gouges away 31 percent of the Environmental Protection Agency’s budget and 29 percent of the State Department’s funding. This would all be horrifying, if it weren’t already being written off by Republicans who will have the power to entirely ignore it. Rubio is just stating a fact—Congress votes on appropriations. Presidential budgets, on the other hand, are mostly exercises in political messaging meant to outline the White House’s priorities, which in the case of the current administration mostly entails bug-eyed nationalist posturing. The budget is literally titled “America First.” Wimpy liberal priorities like environmental protection and the arts get the ax. (It not only eliminates funding for the Corporation for Public Broadcasting—Big Bird is in the crosshairs yet again—but also the endowments for the arts and humanities.) Money for international aid and diplomacy take a deadly cut in favor of more ships for the Navy and more soldiers in the Army and Marines. Contemplate that. The Trump administration somehow managed to write a budget that amps up military spending and simultaneously pissed off Lindsey Graham. This is the guy who loves war so much he wanted to put American boots on the ground in Syria. It’s like handing Cheech Marin a bag of weed and having him throw it back at you in disgust. Maybe Republicans will feel warmer to some of Trump’s domestic cuts. But even that seems a bit unlikely. According to the New York Times, GOP staffers on Capitol Hill are pissed off the chronically disorganized White House dropped the budget while giving them zero “guidance on its details or how to sell the plan.” Meanwhile, half its contents are obvious attack-ad fodder. Consider: Trump supposedly wants to reduce the budget for the National Institutes of Health, the major funder of biomedical science in the United States, and general symbol of bipartisan pride, by 18 percent. Does anybody in Congress really want to be the guy who decimated cancer research? And what senator wants to explain to the pharma lobby why they took a hatchet to the basic science that fuels their drug pipeline? Trump also supposedly wants to abolish the Community Development Block Grant, which funds meals on wheels for seniors among other cherished initiatives, and the Low-Income Home Energy Assistance program, which helps a whole lot of old people pay for heat in the winter. There you go—a budget literally designed to leave elderly Americans eating cat food in the cold. Enjoy that one come campaign season. Meanwhile, even the current head of the EPA, former Oklahoma Attorney General Scott Pruitt, who was selected for his job precisely because he hates the EPA and thinks climate change isn’t really a matter of grave concern, reportedly asked for a smaller budget reduction than what he got here. The man Trump brought in to dismantle this agency thinks the president is overdoing it. I say Trump supposedly wants these things, because I personally doubt he’s actually read his own budget. I mean, I assume somebody explained the broad outlines to him, hopefully. But according to Politico, Mulvaney said the document “was assembled in part by examining excerpts from the president’s speeches and media interviews.” Maybe they were just being extra careful about cross-checking their work with POTUS’s campaign promises, but that doesn’t sound like the sort of thing you’d do if the man in the Oval Office was particularly engaged. 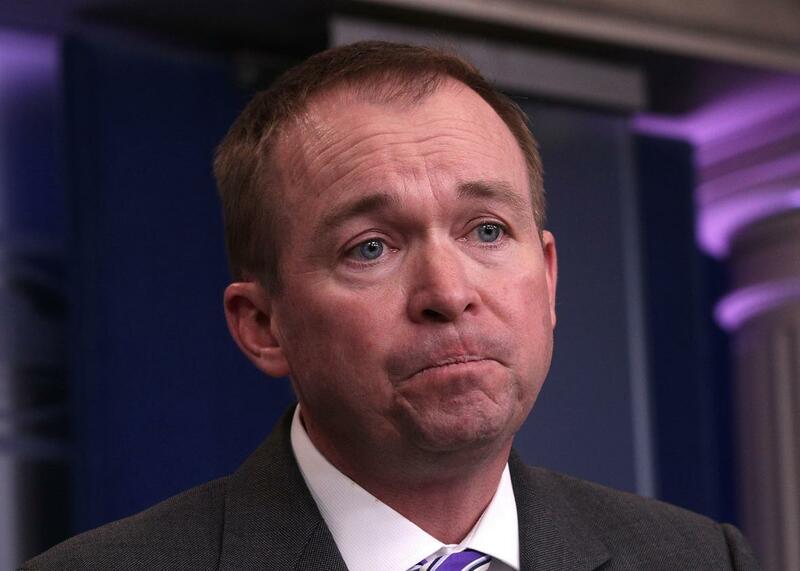 Overall, this document has all the politically tone-deaf hallmarks of a Tea Party fantasy scribbled hastily on the page, which isn’t shocking, since before he was budget director, Mulvaney was a Tea Party congressman who wanted to breach the debt ceiling rather than raise federal spending. It should be said that this is not even a full budget. Rather, it’s a “skinny” version that presidents issue early in their first year that doesn’t include line-by-line spending details or deal with issues like entitlements. In that respect, it’s even more of a glorified press release than your typical presidential appropriations request. And in this case all it tells us is that Trump wants to spend bigger on guns, boats, and bombs, and doesn’t care much about whether the planet fries. And yet, while espousing those perfectly conventional conservative values, it’s still managed to alienate other Republicans who will be essential to implementing the administration’s vision. Insofar as they refuse to go along with his plan, it will be another example of Trump’s inability to lead his own party. If this is an administration whose malevolence is only tempered by its incompetence, as Lawfare’s Benjamin Witte so perfectly put it, this budget doc is its perfect symbol.